Already subscribe? Log in here. Geography in the News is a free homework assignment published every week. It has been developed to encourage students to engage with news stories that have a geographical theme. By setting up a free subscription to Internet Geography you will have access to Geography in the News mark schemes. To support the development costs of Internet Geography we have developed some resources that are being sold via Payhip. You can access these resources below. Free resources are further down this page. Geography knowledge organisers – available to download for free in .pdf format. Memory Geoggers – approaches to support revisiting GCSE Geography skills, knowledge and understanding. Also useful for homework activities and revision. Four of a kind – Four of a kind is a thinking skills activity that can be used for revision, a lesson starter or plenary. Students group keywords/features into groups of four and explain their choices. Odd One Out – Odd one out activities provide a nice thinking task that can be used as a lesson starter or as part of a revision session. Provide students with a group of words, which contain an odd one out. They are to identify which is the odd one out and give a reason for this. Concept Mapping – Students identify links between different concepts. A great AfL tool for establishing what students understand and what they need to work on. Particularly useful for revision or checking understanding before an assessment. Take a look at our geography diagrams for use in your classroom. If you have a request for a diagram please contact us. 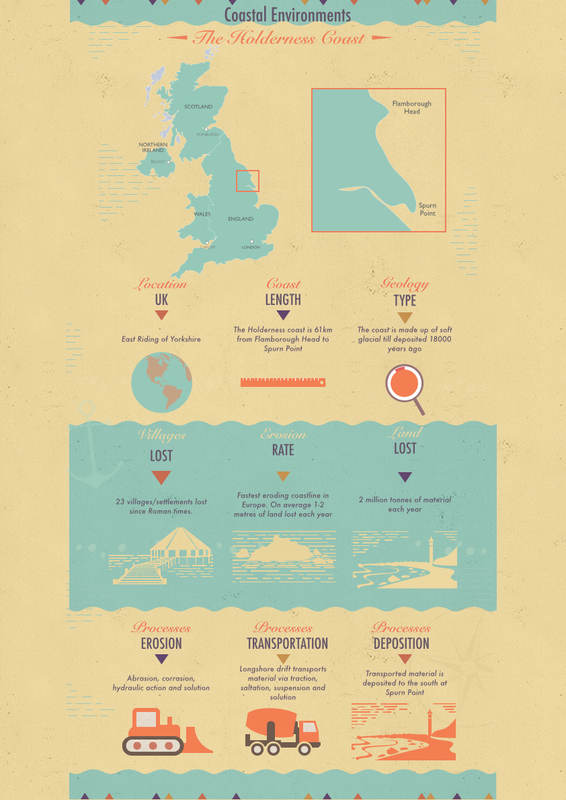 An infographic covering the Holderness Coast, East Yorkshire available in jpg and pdf. What has coastal deposition got to do with having a wee?